Welcome back. This is the second post in a two-part series: “How Senegalese Agricultural NGOs Are Adapting Mobile Technologies,” based on a follow up of over 50 Senegalese agricultural NGOs who attended the U.S. Embassy’s TechCamp Dakar. The first provided background and context on mobile technology in rural Senegal. 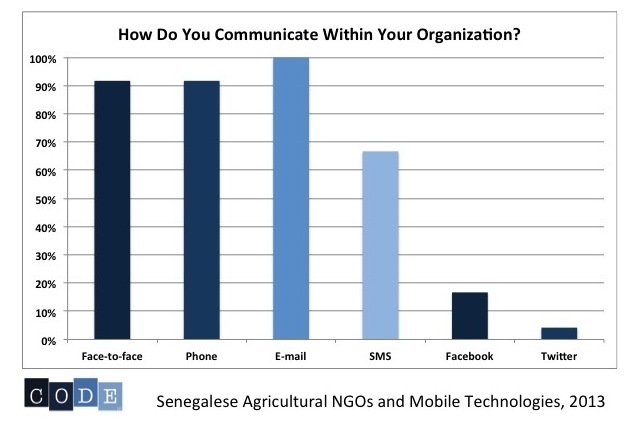 Here, we explore the results of our follow-up survey to find out how NGOs are using mobile technology in their agricultural programming. Supplying seeds, tools, fertilizer, et cetera (62.5%). Graph: What Are The Agricultural Areas that Your Organization Focuses On? We were also curious as to how organizations are using ICT and mobile technologies in the workplace to coordinate programs and communicate with partners. Most organizations already use computer technology in the workplace, mostly for data collection, sharing, reporting, and communication. As you can see in Fig. 2, within organizations, most communication happens via e-mail (all organizations use e-mail), telephone, and in-person conversation. SMS, Facebook, and Twitter are used much less, which represents an opportunity for these NGOs to communicate with and reach a wider base of beneficiaries and supporters. Graph: How Do You Communicate Within Your Organization? We found that organizations already use technology to communicate with those who benefit from their projects -- beneficiaries from urban citizens in Dakar to rural, smallholder farmers living across the country. Fig. 3 shows that most communication between organizations and beneficiaries is via telephone. In fact, all the organizations we interviewed use telephone to communicate with their beneficiaries. In-person communication and email were also common outreach tools, but SMS and Facebook barely made this list. Graph: How Do You Communicate with Beneficiaries and Receive Field Data? Currently, most organizations communicate with beneficiaries several times a month (see Fig. 4), but an overwhelming majority (56.5%) wish to communicate with beneficiaries every day. These results show that mobile technologies do play a part in current agricultural programming, although we found that the application of new mobile technologies is limited so far. It seems that NGO staff fieldworkers may use computer and phone technology at their office, but there is a lack of agriculture-based projects that rely on the use of mobile technology at the very local (for example, village) level. Since TechCamp, about half the organizations have begun to explore new technologies, such as low-cost video, Frontline SMS, Mobile Money, GoogleApps, and mapping technologies, and find that learning such technologies on their own is often a complicated and confusing task. “We used computers before TechCamp, just for administration, but not as a tool for amplifying work. TechCamp has allowed us to have a large vision, but we struggle to implement this.” - Mandiaye Pety Badj, Community Manager at Enda Graf Sahel. Mandiaye exemplifies the experience of most of the interviewed NGOs in regards to their experience implementing new TechCamp technologies. For those who haven’t begun to use TechCamp technologies yet, all plan to integrate them into programming to a higher degree in 2013 or after receiving further training in methods of application for each technology. All organizations expressed the need for further training before they can successfully implement new TechCamp technologies. However, all organizations surveyed express a desire to implement mobile technologies in their workplace and agriculture programming in the future. There is a general consensus amongst Senegalese NGOs that TechCamp was beneficial in that it brought like-minded organizations together and started the dialogue as to what these new technologies are and how they can be used. NGOs stated that the new technologies most relevant to agricultural programming are, in order of most to least (see Fig. 5): Frontline SMS, low-cost video, GoogleApps, and OpenStreetMap. Graph: Which TechCamp Technologies Are Most Likely To Be Useful For Your Projects? As you see in Fig. 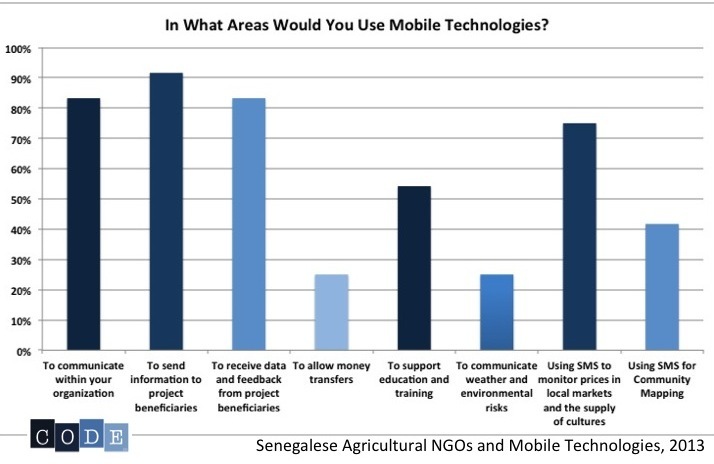 6, most organizations expressed interest in applying mobile technologies to more than one area of agricultural focus, with the highest interest being in: sending information to project beneficiaries, communication within the organization, receiving data and comments from project beneficiaries, using SMS to follow market prices and supply, and supporting education and training. Graph: In What Areas Would You Use Mobile Technologies? All organizations replied that they are ready now for further training on the implementation of mobile technologies, with an emphasis on technical support and training in new technologies, networking opportunities with other organizations, and provision of mobile and technological materials. In general, Senegalese NGOs already use computer, Internet, and mobile phone technologies in the workplace, and to a more limited extent, on agriculture-related projects. Organizations expressed interested in future TechCamps, training workshops, and access to video trainings as possible methods to master mobile technologies. Although mobile technology plays only a limited role in agricultural programming, this is changing. The challenge? Getting up to speed on how to use the technologies in the first place. The majority of NGOs requested follow-up video trainings on the mobile technologies presented, which Code will facilitate and share on the Facebook group. Of course, being able to access an online video posted on a social networking site assumes a high level of digital literacy, but we were assured by participants that they could access these platforms through office computers. LOOKING FOR PARTICIPANT RESOURCES? CLICK HERE.